Nitroglycerin is a vasodilator, a medicine that opens blood vessels to improve blood flow. It is used to treat angina symptoms, such as chest pain or discomfort that happens when there is not enough blood flowing to the heart. To improve blood flow to the heart, nitroglycerin opens up (dilates) the arteries in the heart (coronary arteries), which improves symptoms and reduces how hard the heart has to work. Sit or lie down to take your nitroglycerin. If you are driving, pull over and park the car. Taking nitroglycerin can lower your blood pressure, which could cause you to pass out if you are standing up. Place the under-the-tongue (sublingual) tablet under your tongue. Leave it there until it dissolves. If you accidentally swallow the tablet, take another. The medicine won't work if it is swallowed. Place the between-cheek-and-gum (buccal) tablet between your cheek and gum. Leave it there until it dissolves. If you accidentally swallow the tablet, take another. The medicine won't work if it is swallowed. Take one tablet as directed by your doctor. Ask him what to do if you do not get relief within a very short time. He may tell you to take another tablet after 3 to 5 minutes. Ask your doctor to tell you when you need to call 911 or other emergency services. If the pill doesn't work you are in an extreme emergency situation. Your tablets will come to you in a brown glass bottle. Commonly they are available in 100 tablet bottles or a set of 4 very small bottles, each holding 25 tablets. Warmth, moisture and light will damage the tablets. Do not carry the bottle of tablets in your pants pocket. Your body warmth will hurt them. It is safe to carry them in a jacket or purse. There is no cotton filler in the bottle as you will usually find in any other pill bottle. That is because the nitroglycerin tablets are unstable and will lose their potency if they come in contact with any other substance other than glass. Therefore, do not take the tablets out of the glass bottle to put them in a plastic or metal pill holder. That will ruin them. 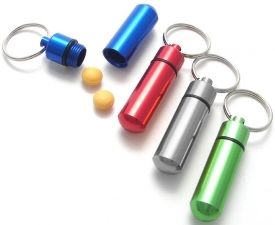 Here are pictures of products we have seen advertised specifically as nitroglycerin tablet holders. Don't use them. They will degrade your tablets if you use them. You need to keep the tablets safe. For your convenience, and the safety of the tablets, we offer a pill safe, suitable container to hold the smal l 25 tablet bottle so you can clip it a belt or belt loop. It is a waterproof, lightproof plastic container. You put the entire glass bottle inside. 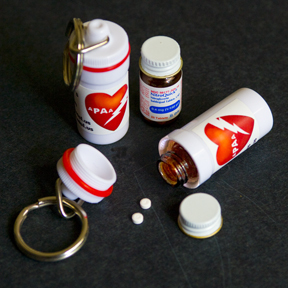 It also has the APAA sticker on the container to act as a medical alert in case of an emergency to identify you as having PA, so time is not wasted. We will include a carabiner to conveniently hook it to your belt or belt loop. Buy one for a friend as well. Includes a carabiner to attach to your belt or belt loop. The postage cost of $2.61 will be deducted from the $13. The rest will be accepted as a donation to APAA with our thanks..